The term deceleration is the most commonly used term when players come to me to work on their putting. This has lead me to put together a few thoughts on how acceleration and speed play a large part in successful putting and also how they differ. When players struggle with their distance control they have a hard time either getting the ball to the hole or they will aggressively putt the ball well past the hole. This is typically an acceleration issue that causes a speed issue at impact. Let’s define speed and acceleration before we go further, so that we all have a clear understanding of the difference. Speed is the amount of distance divided by a time interval that it took it to arrive, in this case the putter has speed when it traveling through impact, but the rate that it changed directions from the start of the backswing towards the ball is acceleration. The consistency in the change in direction is the acceleration we are concerned with in the putting stroke. Here is a simple analogy about speed and acceleration. If you are driving down the highway at 70 miles per hour and you have the curse control set, then your speed is set at a constant speed. There is not a chance in speed, thus no acceleration. This was a common teaching mentality for players that think the putting stroke works like a pendulum on a clock. This is not how I teach putting, but a common response in lessons. Acceleration on the other hand would be defined as the rate an object changes speed, where as speed doesn’t measure change in direction and doesn’t affect the measurement. A simple analogy for acceleration would be starting from a stop sign and pressing the “accelerator” on your car, hints the name. The car would go through a change in direction at a certain rate, this is acceleration. Now that you have gone through a short physics lesson, let’s put this into putting terms and get a deeper understanding of how the putter uses these terms. When you look at a player putt during their round we can all make observation about the “tempo” of the players’ stroke and in reality you are observing the acceleration or lack of acceleration while they are putting. This is another term that has crept into the golf world that should be replaced with a more proper term, acceleration. Take a look at the following chart and we are going to talk about the proper acceleration of the putter when it starts to move towards the ball in the down stroke. 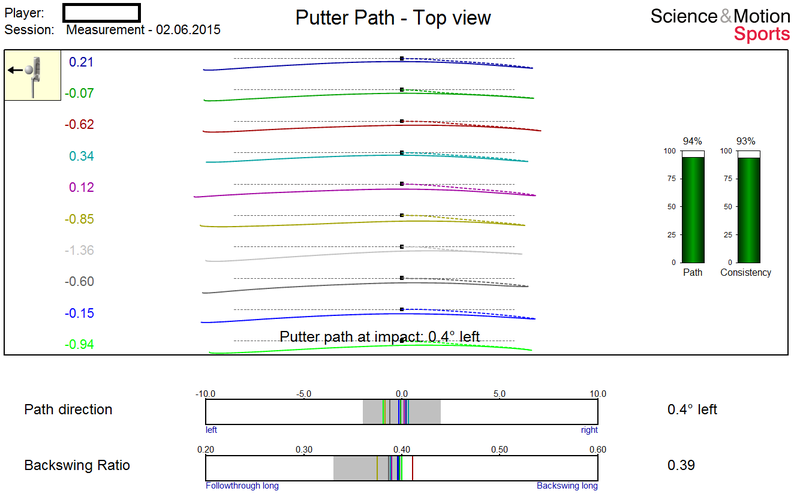 The chart shows two acceleration profiles (bottom right hand chart on each report) that are polar opposites and would create different types of speeds at impact for the same 11’ putt. As you can see that would create an issue for speed control. The goal is to have a chart that looks like the bottom chart, where there is a flat troth look to the chart. 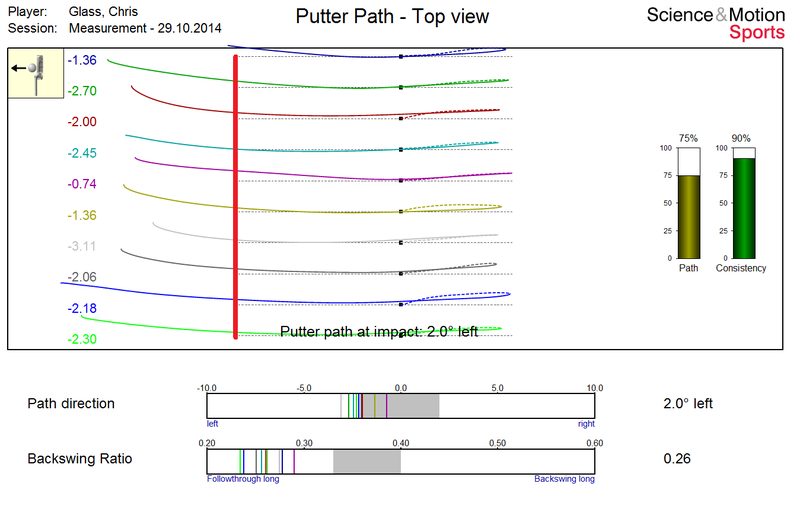 If you take your eyes and follow the chart from the beginning you would see that the putter accelerates to just a little over 5000 mm/s2 which is a fairly good goal for an 11’ putt. 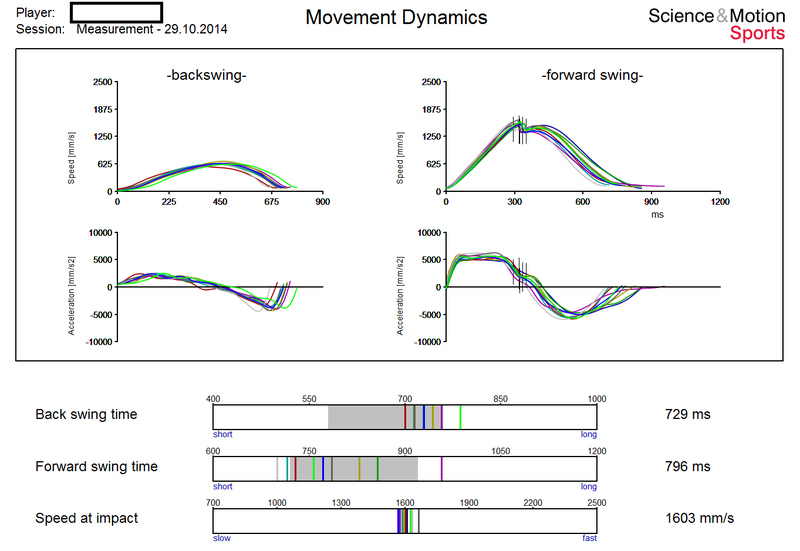 Then the putter will stay at a consistent rate of acceleration, not speed remember. 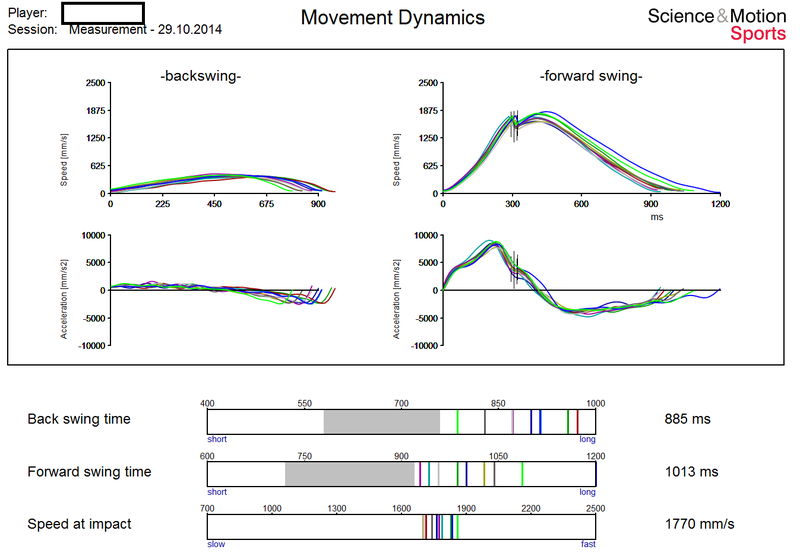 The speed is increasing but the rate of change in direction is consistently moving towards the ball. This is ideal for players looking to control the distance the ball rolls. The second chart however is from a player that has a much longer finish to their stroke and so has more time to accelerate during the stroke. Notice that this give him a higher speed at impact, this would obviously case the ball to roll too far for an 11′ putt. Notice the Backswing Ratio listed at the bottom of each report. The top report lists a .26 Backswing Ratio and he bottom players posts a .39 Bakswing Ratio. PGA Tour average is .33 and .40, which is the length of your backswing compared to the total length of the putting stroke. This plays a large role in proper acceleration. Notice in the first chart I drew a red line where the putter should stop and the second player is stopping the putter in the correct position. Now, to create that consistency there is another simple analogy that will allow you to see the importance in the length of your stroke. If I placed you in a car at a stop sign and I told you that you could press the accelerator as hard or as lightly as you would like and in four hundred yards slowly bring the car to a stop. One stipulation, you have to get the car at lease up to 60 miles per hour in that four hundred yards. Now, if I placed you at the same stop sign, but now I told you that there was a stop sign about one hundred yards in front of you and that you needed to get the car up to 60 mile per hour before you stopped the car. Each driver now would have a very similar acceleration pattern where as before it is left up to the interpretation of the driver. This would be due to there is not enough time or distance for interpretation on when the car must be going 60 miles per hour, there is a short window and you must acceleration and the quickly decelerate to stop at the stop sign. In the last example all the cars would immediately accelerate to 60 mile per hour and the slow down to just barley make the stop sign. Now imagine this in putting and some where along that road there is a impact point with the putter, say half way think about the speed at the halfway point of the two different examples and what might be more reliable. Putting is no different and the length of your backswing and follow through are very important aspects of your putting and how to control these in a nontechnical manor is the answer to good speed control and keeping the ball on the intended line for breaking putts. I think of everything in ranges and there is no perfect distance to bring the putter back and through, but there are ranges that good players play inside of and that is what I can help you do with your putting. So next time someone tells you that you are decelerating think about the car analogy and consider shortening your backswing and following through to increase the acceleration in your putting stroke.